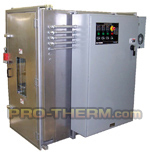 PROTHERM, LLC offers a wide variety energy efficient electric IR heating equipment for continuous sheet/web processing. Some applications include drying ink, adhesives and coatings; preheating for embossing or thermoforming; curing or fusing vinyl, silicone and neoprene; sintering Teflon; post heating, converting and heat-setting textiles and fiber reinforced polymers. With recent government mandates to reduce carbon footprints and “green” initiatives, Protherm, LLC Electric Infrared Equipment is the ideal choice to reduce emissions and utilize a clean, high efficiency, environmentally friendly heat source. Our clean electric heaters do not produce greenhouse gasses, hazardous by-products, or add any other variables to your process. The Series FS/FSA heater style is proven to be the highest efficiency available giving you the most heat transfer for your energy dollar. Protherm, LLC Series FSA Heaters are normally use for replacing or adding to the drying sections on many brands of printing presses, and to aid drying behind ink jet printers. Many people are switching from solvent to water based inks and coatings which requires additional drying capacity. Protherm, LLC fast responding medium wavelength infrared heaters are an ideal solution to efficiently dry water based coatings is a small footprint. Web dryers offer single or double sided heating. With single sided, a hinged heat shield is often supplied to enclose the product in the heated chamber for fast efficient drying. Exhaust ports can also be supplied to extract water vapor and any unwanted ambient heat. Air input fans are also normally included on PROTHERM, LLC drying systems to scrub or break up the layer of vapor that is formed on the product surface as it is drying. This increases the infrared absorption rate for faster drying speeds. Upon line stops, power is turned off to the fast responding heaters, but the input fans normally continue to operate to cool the system and web. In Protherm, LLC control panels, we offer an optional off-delay timer to automatically turn off the fans when cool to help conserve energy. 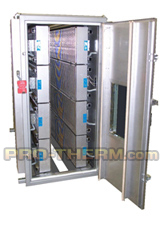 Many Protherm, LLC heaters, heater banks, and systems are used to process textiles and other wide web applications. 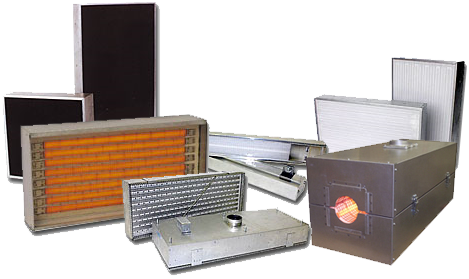 Our heaters boast an unmatched balance of quality, high heat output, controllability, fast response time, and efficient heat transfer. They can be precisely controlled and zoned across the width of the web to increase the infrared energy to where it is needed, and turn it if off where it is not. Custom systems have been built to evenly heat sensitive webs up to 22 ft wide. We welcome the opportunity to review your heating process. Please feel free to contact our sales engineers so together we can provide a clean efficient solution to help you start saving money.